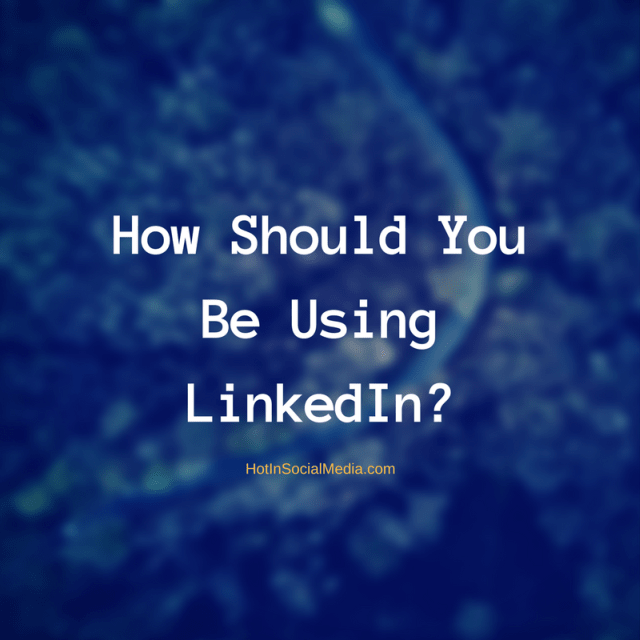 How Should You Be Using LinkedIn? Recently, I have been very active using LinkedIn. And for the record, I still use Facebook in most things but recently, LinkedIn seems to be a better choice. For starters, I am starting to feel that Facebook is very cluttered. Sure, I did a lot of changes on my Facebook newsfeed but there are things I still wish Facebook can improve down the road. Here are some things you should be doing with LinkedIn nowadays. LinkedIn is a professional platform where you can start engaging with like-minded people. Sure enough, there is some spam from time to time, but it is still a great place to spend some time on. When it comes to connecting with others, it is important to ensure that you are connecting with the right connections. To get a better picture (and for LinkedIn’s algorithm to work properly), always update your profile with the latest information. This will allow LinkedIn’s algorithm to do what it is supposed to do — that is to connect you with people within your niche. I reflected this to my previous actions. Those days, I am always trying to connect with as many people as possible on LinkedIn without taking into consideration of their niche and interest. While you can increase the number of connections dramatically, you are NOT going to be able to connect with them professionally. For starters, you will have different likings and therefore, it will just be another challenge to break the ice. LinkedIn is a great platform for you to look for jobs. You will be surprised that there are many Human Resource personnel who constantly publish job vacancies on LinkedIn. What you need to do is to use the search bar on the top of the screen and search for your dream job. Make sure you use generic terms such as “Social Media Manager” or “Office Manager” to get more exact results. The term I use is “Front Office Manager”. If you are hunting for a job, head over to the ‘Jobs’ and ‘Posts’ tab to get relevant job opportunities related to the keyword of your choice. The only downside using this feature is that LinkedIn algorithm doesn’t seem to sort by date. Therefore, it is important to determine the time the post or job is posted. LinkedIn Premium is always recommended. I love using it and currently, using Premium Career. There are also subscriptions based on Premium Business and Executive. Take a look at the pricing table below. Plus, all LinkedIn Premium users will have access to LinkedIn InMail where you can reach out to people out of your network. Compared to Facebook and Twitter, LinkedIn doesn’t allow you to connect or message people outside of your network. Now, this is challenging since there is no way to connect with these people by yourself and one of the most effective ways is through LinkedIn Recommendation. With this feature, a mutual friend would need to introduce you to the new contact before both parties can connect. This makes LinkedIn connection more legit and effective. It is also a great way to avoid spam. Did you know that being a LinkedIn Premier user would allow you to be push to the top of the candidate list when you apply through LinkedIn? Being a Premium user would allow you to connect to people out of your network through InMail feature. More on this below. When you subscribe to LinkedIn Premium, you will get InMail feature where you can reach out to a wide range of audience. Typically, people who have not connected to you in any way. Every month, you will get LinkedIn InMail credit which can be used to connect with high profile or key influencers within your niche on LinkedIn. Premium Career comes with 5 credits a month, Premium Business comes with 15 and lastly, Executive comes with 30 per month. Here’s where the beauty of LinkedIn InMail feature not many people knows about it. Sending out a cold message to people out of your connection or network will utilize one credit. However, when the receiver of the message responds back to you, you will automatically be refunded the one credit. Now, think about this. This feature ensures that you do not randomly spam people with cold messages and when someone replies to your InMail, it shows that they are (in some ways) interested in your proposal or whatever it is. Unlike Facebook and Twitter, LinkedIn InMail allows you to be more proactive and start thinking out of the box to ensure that messages sent are unique and engaging. What should you know about LinkedIn for 2017? There will be influencers telling you that LinkedIn is useless in today’s world. I know I did that in the past but no, LinkedIn is not dead. It is really powerful and powerful only when you use it correctly. Unlike other social media platforms, LinkedIn isn’t that easy to use when compared to Facebook and Twitter. There are many things that can drive results (through LinkedIn) if you have the right strategy. If you are starting out new on LinkedIn, consider learning the basics. Here are two great links: LinkedIn’s Official Website and Mashable. Overall, LinkedIn is a great platform to use especially for finding new careers, building a strong network and even to connect with your peers. The only downside using LinkedIn is that you need to be patience to build your own network because LinkedIn doesn’t allow you to connect with everyone with just a few clicks. It requires you to do more, such as to engage and communicate with the prospect before connecting. Are you using LinkedIn for business or career? Leave a comment and let’s discuss further on the topic!